I rarely finish a book in a single day, but I did that with this one. 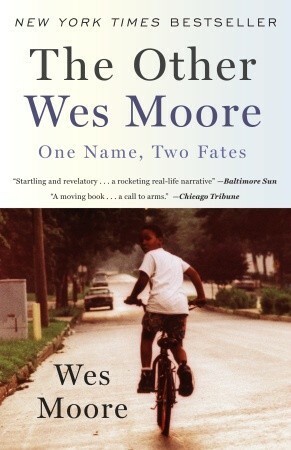 It’s a compelling narrative about two men named Wes Moore. They’re from similar backgrounds in Baltimore, but a combination of choices and circumstances took them in different directions. The author, Wes Moore, a Rhodes Scholar and White House Fellow was headed down the wrong path when his mother took drastic action. He then read a book by Colin Powell that showed him that stories can change peoples lives–and Powell’s story changed his. The other Wes Moore, though, didn’t change, and the author has the opportunity to interview him in prison, where he is serving a life sentence. There is a lot to absorb here about poverty, education, drugs, and opportunity in America. This book, like Powell’s, is potentially going to change lives.